Johnston, IA; October 4, 2018 – Stahl completed an adaptive reuse project for Johnston Community School District. The project repurposed Johnston Middle School into Wallace Elementary and Johnston Early Learning Academy (JELA). The 160,000-square foot renovation features moveable glass walls facing the common area in most of the studios. The $16 million state-of-the-art facility will offer an open environment for learning and, with the opening of JELA, will consolidate the District’s preschool classrooms in one building for the first time. Site improvements at Wallace Elementary and Johnston Early Learning Academy include a new bus loading and unloading zone, two fenced playground areas, and two updated entry facades. Stahl was awarded the project after completing the new Johnston High School for the 2017 school year. The 369,000-square-foot high school is the second largest in the state of Iowa and services over 1,600 students in the area. After the new high school opened, Stahl also completed the Johnston High School athletics facility for the District. Stahl continues to support the District alongside frk architects + engineers on other projects including renovating the Johnston High School Baseball and Softball Complex and transforming the previous Wallace Elementary into the District’s Administrative Resource Center. A grand opening ceremonial ribbon cutting was held on August 26th with representatives from Johnston CSD, Stahl, frk architects + engineers, and members of the local community. 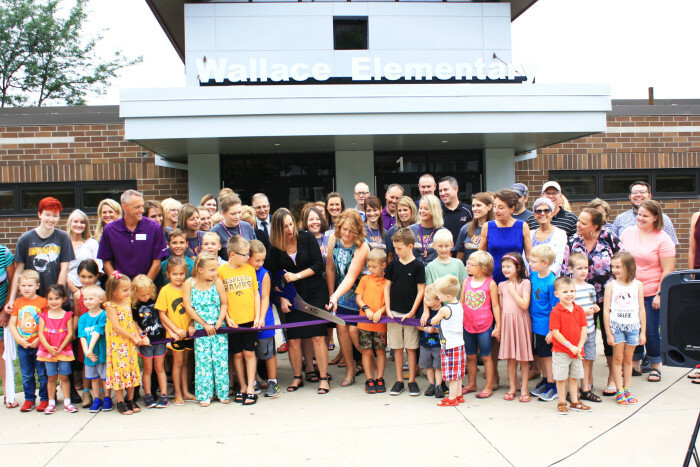 Suzanne Pearson, Principal at Wallace Elementary, along with other Johnston Community School District officials, Wallace Elementary staff, Johnston community members, and students cuts the ribbon at the grand opening ceremony on August 26. Joy Palmer, Director of Johnston Early Learning Academy, along with other Johnston Community School District officials, Wallace Elementary staff, Johnston community members, and students cuts the ribbon at the grand opening ceremony on August 26.